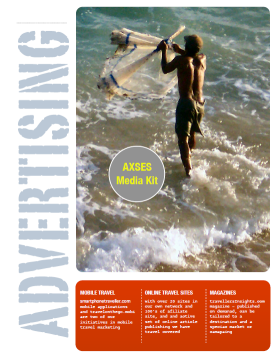 The Media kit Can be a formal document that accompanies your publication and conforms to Rate Card standards. It may contain rates and advertising descriptions, page sizes and cuts. It may have demographics of the target audience, readership and circulation data. In some cases, as in our example, we wanted a graphical representation of advertising and placement offers along with rates. In the digital work that is fast taking over off-line print media, advertising is mostly interactive and may require the client buy technology. This is the case with arcRes marketing. You may be in map or a shopping cart only if you subscribe to the technology. for example one must subscribe to the booking engine to be in a booking channel. In addition one can get special placement and be featured.